The ‘New Forest House’ is set within a stunning 18.5 acre plot, located adjacent to ancient woodland and heath, in the New Forest National Park. The new building has been carefully conceived in order that the proposals minimise the impact on the site and its sensitive surroundings. The main house and guest annexe are orientated to maximise solar gain and utilise renewable technologies for heating and hot water requirements. The materials used throughout are sustainable, durable and locally sourced where possible – in harmony with the site and its surroundings. The architectural objective has been to create a simple building whose form, scale materials and detail reinforce the character, distinctiveness and history of the site locally and within the wider context of the New Forest. The site for the ‘New Forest House’, our first major new build commission, is located in the beautiful New Forest National Park within a designated Conservation Area and Site of Special Scientific Interest. The brief from our clients was to create with them a very contemporary sustainable home. This home should also sit comfortably within the landscape which is comprised of 18 acres of stunning ancient woodland with far reaching views towards the Isle of Wight. The initial concept for the building was formed quickly. Our aim was to recreate the sense of suspense experienced upon entering the site as the landscape gradually unfolded. Upon arrival one encounters magnificent ancient beech trees with fallen trunks that lie scattered amongst heather. The original wooden cottage dwelling on the site was hidden from view behind many trees and had to be sought out. Once the house had been discovered the distant view was revealed as the landscape to the south of the house changed from woodland to open heath – dropping dramatically into a valley before rising up again to a distant pine forest. We decided to insert a long spine wall element on the plan, with a narrow entrance slot cut into it, to both focus views and contain excavated earth. Instead of looking towards the distance one’s attention is immediately focused upon the beech trees. As a result of the building’s sensitive location the planning restrictions placed upon the building were considerable. The newly formed National Park Authority approached the proposals hesitantly due to the contemporary nature of the scheme. However, the sustainability credentials of the proposals helped enormously and Natural England were very supportive. After extensive dialogue the plans were passed via delegated powers. The footprint of the new house was restricted to 120 sq.m. – 30% bigger than the original 2 bedroom cottage. In negotiation with the planners it was agreed that a basement would not add to the bulk of the building, and a guest annexe was also permitted as the old building had previously had separate guest accommodation. The massing, form and orientation of the new buildings were carefully conceived in order that the proposals had minimal impact on the site and its surroundings. The form of the main house and guest annexe were designed as very simple timber clad boxes that echo each other and are linked in by a concrete spine wall which also vertically links the ground and basement. Both forms are low rise volumes with green roofs planted with sedum native to the UK. The buildings were orientated to maximise solar gain, open to the south and closed to the north. They utilize ground source heat pump technology, solar thermal panels and log burners for heating and hot water requirements. Provision for the future addition of photovoltaics was included at strategic points. Water is sourced from a refurbished well within the grounds. The earth that was excavated to form the basement below the main dwelling and natural swimming pond area was re-used in the earth berm to the north of the spine wall, limiting the need to remove material from site. This helps to insulate the building, provide a visual screen to the north and acts as an acoustic baffle from nearby traffic noise. New Forest Douglas Fir was sourced from within 2 miles of the site and was used to form the shuttering panels for the board marked concrete spine wall. To minimize wastage the formwork was reused throughout. After the spine walls were complete the formwork was cleaned up and used to clad the interior of the workshop. The main contract for the project was negotiated with one local contractor selected both for his track record and his commitment to create something special on the site. Construction commenced in September 2008 and was completed just less than one year later in September 2009. A standard JCT 2005 contract was used. Although the budget is generous, the nature of the site and the planning constraints consumed a considerable amount. The house is located 1 mile down an unmade track which substantially increased the preliminary and site set-up costs. The previous building had to be demolished by hand as a bat survey revealed the presence of 1 bat in the chimney area which was re-housed by a specialist. Reptiles within the garden were translocated over a 2 month period and reptile fencing remained in place throughout construction. One month after construction was complete the natural swimming pond was already teaming with lizards and an array of colourful dragonflies. As far as possible materials are locally sourced and local craftspeople have been employed. The clients are very special and private people who have become and good friends with us and many of the people involved in creating their home. Regardless of the architectural merit we believe this house possesses, our clients love their new home and they have fully engaged with the process of making. We believe that this house has the potential to be truly sustainable because it will be cared for and enjoyed for many decades to come. 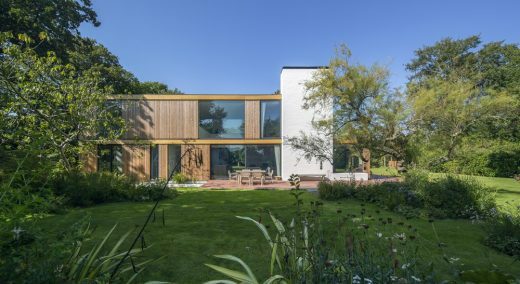 The ‘New Forest House’ was commissioned by a couple in their early fifties who hope to spend their retirement years in their new home. It is sited on a steeply sloping forest site. Previously it would have been impossible to enter the old cottage due to the terrain of the path to the front door and the stepped entrance. Access is now possible to all ground floor areas of the house. A level drop off point provides access to a ramp which wraps around the concrete spine wall and negotiates the substantial level difference across the site. Level thresholds to the large sliding glass doors give access into the main living / dining for wheelchair users. A removable internal ramp enables access to the ground floor bedrooms and bathrooms which are located 2 steps above the main living area. A separate contained guest annexe currently provides accommodation for the couple’s elderly parents who frequently visit. It is planned that in future years this will allow a carer to live on site should necessity dictate. The materials used throughout are natural, nontoxic and breathable. Surfaces are tactile enabling sensory placement for the visually impaired and the organic paint used throughout will not emit harmful toxins. Particular attention has been paid to ensuring that materials and environmental systems are low maintenance enabling the clients to easily manage their home. This home is intended to cater not just for the changing physical needs of its occupants but to provide nourishment and stimulus to the soul through close contact with nature. Established in 2005 the ‘New Forest House’ is PAD’s first major new build commission. We were selected as architects because our clients believed that we were passionate about sustainability issues and that we would bring dedication to the design of their new home. They also had a desire to use local people where possible and were prepared to invest their trust in our young practice. The site is inspiring and uplifting – 18.5 acres of varied landscaping comprising ancient woodland, heathland and bogy mire. This landscape however also proved to be the major challenge to this project. Located within the newly formed New Forest National Park, a conservation area, and a SSSI the site is highly designated. Ecological surveys revealed the presence of bats and reptiles with numerous other protected species adjacent to the domestic curtilage of the site. Natural England provided valuable support throughout the Planning process as they realised that sensitive and ecological redevelopment of the house would ensure the long term management of the land, which has no ‘commercial value’ due to it’s environmental status. Although at first extremely wary of the proposals due to their contemporary nature the local Planning Authority became supportive and eventually granted planning permission through delegated powers. The architectural concept was straightforward: Two simple volumetric forms located along a spine wall. Upon arrival the wall screens distant views to the South focusing attention upon the ancient beech trees to the North. Stepping through a gap in the wall the experience changes as the site gradually unfolds and the landscape beyond is revealed. On a practical level the wall acts as a retainer for the earth that was excavated to form the natural swimming pond and basement, and as thermal mass to regulate fluctuations in temperature. The wall bears the imprint of local Douglas Fir taken from the wood adjacent to the site, and is a palimpsest rewriting of the history of the site. The external landscape infuses this house as the boundary between the two is blurred. ‘The approach that has been taken towards addressing issues of sustainability in the design of the project’. EDP Consulting Engineers were appointed to design the mechanical & electrical engineering services for the project and to assist with the realization of a sustainable approach. The Practice is locally based in Romsey, Hampshire and offers a service in three key areas – energy & sustainability, project engineering and compliance; the former including passive thermal design and the application of renewable & low to zero carbon technologies. Thrifty Beeches is designed to have a low impact on its environment and minimise its energy requirements by the incorporation of passive measures. This has been achieved by firstly considering the form, configuration and construction of the dwelling. The dwelling is ‘open’ to the south and west to capture the heat from the sun via relatively large areas of glazing. This energy is stored within the ‘thermal mass’ of the building. The thermal mass has been increased by constructing the lower level of the dwelling as a basement. The north elevation of the building on the upper level is sheltered by an earth berm and building elements are formed by a relatively heavy concrete construction. Each of these measures increase the thermal mass of the dwelling. The high thermal mass helps to regulate internal temperatures. In the summer energy from the sun can be stored in the structure to reduce peaks in internal temperature. During colder periods the thermal energy in the structure radiates into the internal spaces to reduce heating requirements. A good standard of thermal insulation has also been provided in the walls, roof and floor elements as well as the windows, to reduce heat losses. Natural ventilation has been provided via ground floor openings and high level opening roof lights. Shutters are provided on the outside of the glazing to permit further reduction of heat gains from the sun. These measures enable occupants to further control the internal temperatures via passive measures. Additional rooflights provide the basement with an element of natural (day) lighting which reduces the energy requirement for artificial lighting and enhances the quality of the internal environment. Having minimised the energy demands by use of passive measures, the remaining energy requirements are met by utilizing renewable energy sources and low carbon technologies where practical. As the dwelling sits in the New Forest, local supplies of woodfuel are plentiful and the use of woodfuel heating was considered as the main heat source in order to minimise carbon emissions. However, an important part of the client brief was the initial requirement to cater for intermittent occupation and to have the facility to remotely switch on the heating and hot water services prior to occupation. This requirement led to the adoption of a ground source heat pump (GSHP) system as the primary heat source. The system consists of an array of boreholes and header pipes which transfer energy from the ground via a brine circuit to a high efficiency electric heat pump. The heat pump raises the temperature of the water which is used to serve an underfloor heating system. In the summer the system can be used to provide ‘free cooling’ by transferring the ‘coolth’ from the ground to the underfloor pipework system in the dwelling. The direct energy of the sun is also collected in a solar thermal panel located on top of the house. This combines with the GSHP system to generate hot water for domestic use and can also assist with the space heating. Energy demands are also met by using the woodfuel resource on the site. Woodfuel fires are located in the house and the annexe. The stove in the annexe has a back-boiler which transfers heat to a thermal store. The energy collected in the thermal store is used to heat domestic hot water for use in the Annexe. There is an outdoor Japanese bath located next to the annexe. A woodburner is located adjacent to the bath and is capable of heating the water for the bath by thermosyphon. As well as minimising energy demands, the design minimises reliance on the mains water system by utilising local ground water collected via a well. This well water is treated to a potable standard and is supplied to outlets around the site.